Linda Asaf has been a fashion designer for over 20 years, first in New York City and now in Austin where she makes her home. Her artistic style can be described as classic, timeless, and feminine – dedicated to accentuating the female form. 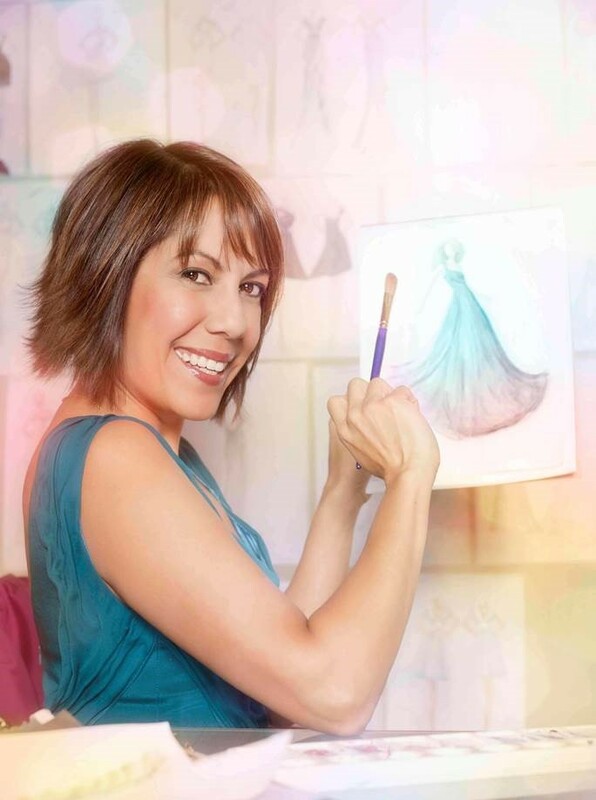 Her specialty is as a couturier for private clients, designing evening, bridal, ready-to wear, swim and resort wear. She recently opened a concept store called Design Lab at Oasis Texas celebrating the best designers in Texas, where she will feature her own line alongside her most respected peers. 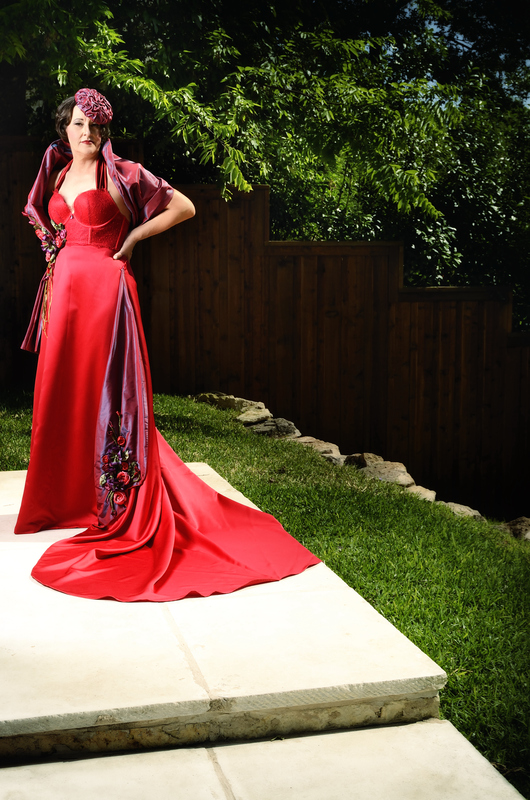 This couture Live Auction Gown was designed and created by celebrated fashion designer, Linda Asaf, exclusively for the runway of Art Bra Austin. Dramatic in both color and style it evokes the glamour of Old Hollywood, and features beautiful bouquets of vintage-inspired, handmade fabric flowers adorning the bustier, skirt, train and stole. The gown is designed so that each piece can be worn separately, providing exponential value for the purchaser. The name of this exquisite ensemble, Hope Springs Eternal, is a powerful double entendre signifying both the hope for a cure and the hope needed to endure a challenging time. 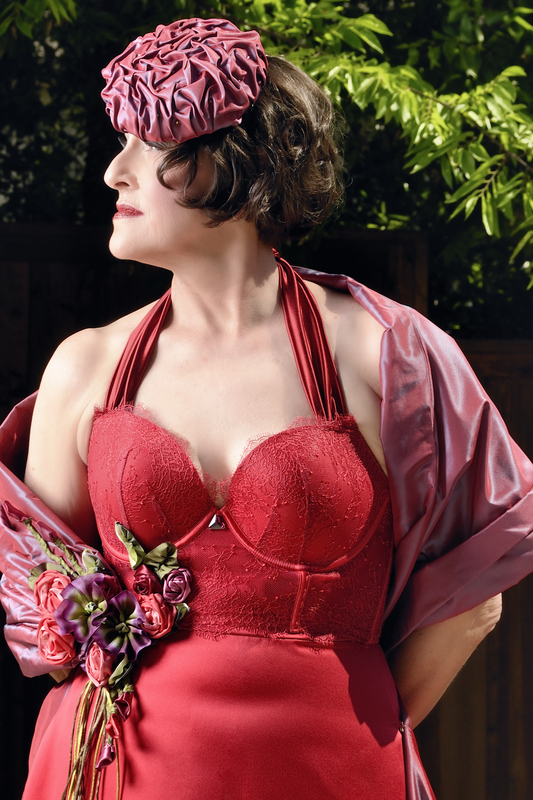 Laura Del Villaggio, a professional milliner who designs under the label “Milli Starr” in Austin, has created a timeless beret fascinator made of a ruched and beaded shot silk taffeta stole, with handmade silk ribbon flowers, to accompany the gown. Laura attended school at the prestigious Fashion Institute of Technology, focusing on a Master of Arts in Museum Studies for Costume & Textiles and a Certificate in Millinery. She creates spectacular hats and headpieces from the finest materials available, including hand-woven straws and imported silks, vintage sequins, feathers and ribbons. Laura’s beautiful design was created in memory of her mother, Helen Halsch. Also in collaboration with Linda Asaf, Mary Kay Samouce, the gifted artist behind ADORN by Samouse, has generously created a custom design necklace and earrings to be worn on the runway by Art Bra Model, Linda Waggoner. ADORN by Samouse is a beautiful collection of hand-crafted vintage statement jewelry designs. Her designs integrate authentic elements from the 1700s, Victorian, Edwardian, Art Nouveau and Art Deco, to midcentury-1950s and 60’s finds, which are deconstructed and presented in new unexpected compositions. To learn more about the professional artists behind this couture Live Auction ensemble, please visit their links below.